Arts & Sciences -- What's in a Name? Some Lodge names indicate the community or geographic location of the Lodge. Other Lodge names honor distinguished members of the Craft who are now deceased. Still other Lodges borrow from the Masonic ritual, drawing attention to implements and symbols "of Ancient Craft Masonry." The latter can be said of the name Arts & Sciences. The lecture of the second degree of symbolic Masonry refers to the seven liberal arts and sciences. If the first degree of symbolic Masonry discusses and identifies the tenets, values, ethics and morals of a Freemason, then surely the second degree speaks to the importance of education and identifies academic topics of intellectual concern in the successful relationships of men and in particular of Freemasons as they provide an opportunity and experience for "making good men better." Such is the nature of our name. We openly declare that we focus our efforts completely on the Masonic education of our members through the cultivation of curious and reception minds. Arts & Sciences is a Lodge of Free and Accepted Masons whose members come together to bring Masonry alive in their lodge and in their lives. We dedicate our efforts completely to the Masonic education and moral advancement of our members. In our travels, we have found that the realm of Masonic education is as boundless as human experience and that commitment to the principles of Freemasonry leads to enlightenment and personal moral advancement. Consequently, an essential requirement of membership is the cultivation of a curious and receptive mind. We care for and instruct our initiates, converse with and challenge ourselves, appreciate and respect our elders. While recognizing these distinctions, within our lodge all but the Master are addressed as “Brother,” and all stand upon the level. As a lodge we are but one among equals. We carry the same charter, work the same ritual, practice the same principles. We strive for excellence in all we do. Our primary purpose is to create Freemasonry within the lodge and practice it without. Click Here to read our complete Statement of Principles. After many informal discussions, a group of Freemasons gathered together on June 24, 2007 on the third floor above the Old Bag of Nails Pub in Westerville, Ohio. They met to revive the old Masonic custom of dining together in fraternal fellowship and to discuss the Craft of Freemasonry. Before the end of the evening, the Brothers present decided to form the Goose & Gridiron Social Club and resolved to gather regularly on the third Thursday every month. The G&GSC met for almost two years, varying its location from place to place, but always meeting in the private dining rooms of the several English, Irish, and Scottish pubs in the Greater Columbus area. Though the sense of brotherhood that developed from these convivial meetings was strong, an even stronger desire grew among the members to form a regular Lodge of Free & Accepted Masons. However, they believed that the conviviality of dining together before the meetings could be maintained, and the "work" of the Lodge could be dedicated to discussion and education, in addition to the initiation of candidates. In accordance with the rules of the Grand Lodge of Ohio, a petition to form a new Lodge was signed by 22 Master Masons and forwarded to the 25 Lodges in the Greater Columbus area for their consideration. After having received the approval of the required 3/4 majority of the Lodges, the petition was forwarded on to the Grand Lodge of Ohio. 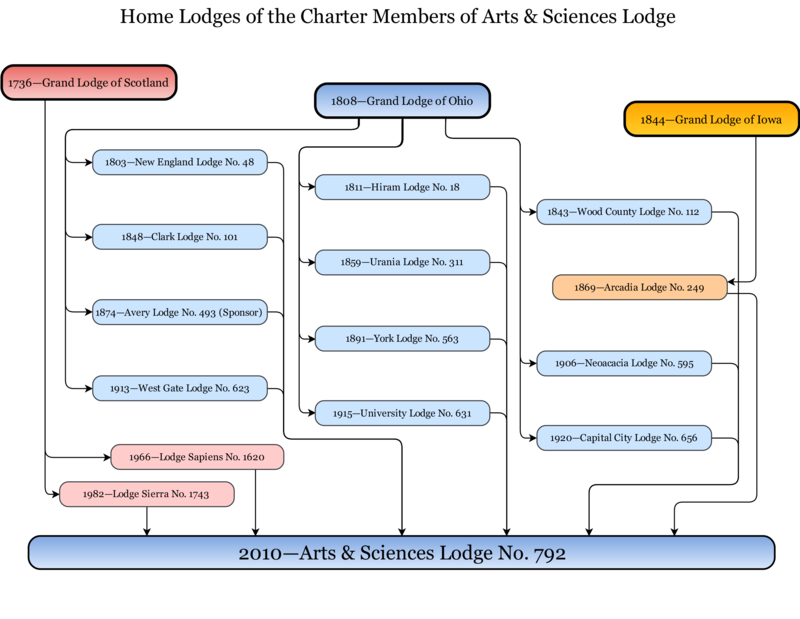 As his first act as Grand Master, Most Worshipful Brother Terry W. Posey signed a dispensation on October 17, 2009 to form Arts & Sciences Lodge, allowing it to meet at the Hall of Avery Lodge in Hilliard, Ohio on the third and fifth Thursdays of a month. He signed the charter for Arts & Sciences Lodge No. 792 on October 16, 2010 as his last act as Grand Master. Most Worshipful Brother Bradford A. Goebel and the Officers of the Grand Lodge of Ohio constituted Arts & Sciences Lodge No. 792 in due form and with proper ceremony on October 30, 2010 at 2:30 pm. Immediately thereafter, Past Grand Master Posey installed the new lodge officers. As regular and duly constituted Lodge of Free & Accepted Masons, Arts & Sciences Lodge No. 792 works to fulfill its goal of being a Lodge that is relevant in the lives of its members and whose members strive to practice outside the walls of their Lodge that which they have learned within it.